Save time with our prefinished air vents, no more sanding, staining or finishing. You can install them right out of the box. Thanks to Finium's application process we are able to offer the very best results in industrial finishes. Finium products are guaranteed 25 years, under normal, non-commercial use, against: flaking, premature discolouration, classification errors, any defect attributable to our manufacturing procedures. The 3 inch x 10 inch black oak floor register is crafted for beauty and durability. It's also designed to complement the most popular floor finishes. With sturdy construction, a durable finish and easy damper operation, this floor register is ideal for use in any home. A quick, simple and inexpensive way to upgrade the look of your home is to replace old floor register vents with new ones. You're no longer limited to builders basic. You can now find designer patterns and finishes in a variety of sizes that bring a modern and decorative touch to what was an often-overlooked item in your home. Modernize your home in minutes with this easy, functional and decorative update. As a great alternative to traditional plastic registers, these elegant bevelled edges with a brushed steel finish are designed to coordinate with your flooring and room finishes. Rust proof dampers make it easy for you to adjust the airflow direction in any room. Measure your duct opening, insert a new Hampton Bay Floor Register, and let the transformation begin. 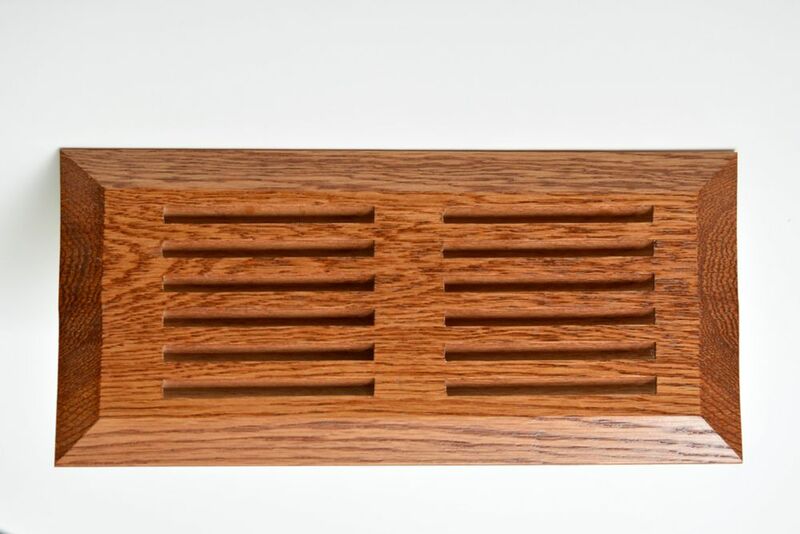 10-inch x 4-inch Oak Floor Register in Gunstock Save time with our prefinished air vents, no more sanding, staining or finishing. You can install them right out of the box. Thanks to Finium's application process we are able to offer the very best results in industrial finishes.